Mount Pleasant Granary - Wednesday 22nd. October, 2014 – Getting along like a house on fire! Up and walked Mix before breakfast. 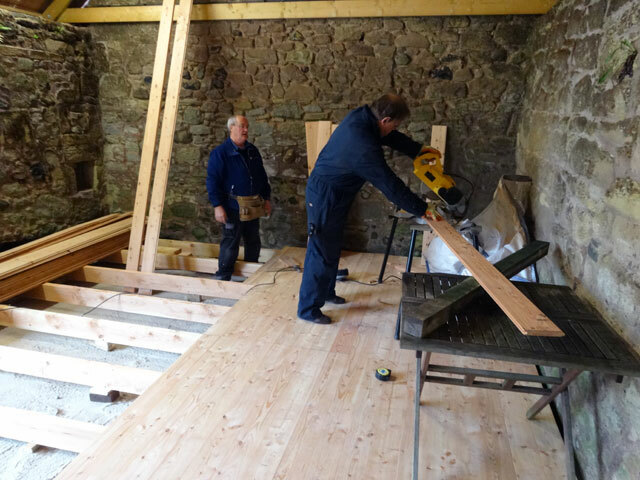 Tom and David arrived and we set about flooring the Bothy. David cutting the timber and Tom and I blind nailing it down. Rachel provided coffee in front of the stove in the Granary in mid morning and again in the afternoon (in the afternoon we got cake). At lunchtime Tom and David both went home, Tom to lunch with Dorothy, David to check on his mail. It was more of the same in the afternoon, but there was plenty of time for banter and laughter and we achieved a lot. The Bothy is going to be lovely. Once Tom and David had left I retired to the summer house to prepare the music for Arrochar’s service this Sunday. Dined in the Granary on steak pie I bought from the visiting butcher this morning and then I drove Mum into Duns to the Guild which she was addressing tonight on her Enigma experiences. Rachel and I watched television in front of the stove -- Scott and Bailey – and soon it was time to walk the dogs and retire to bed.